This luxurious secluded villa, set on the hillside at Bophut, is just five minutes’ drive to Fisherman’s Village and the beaches, and 20 minutes to the airport. Located within spacious grounds, a stay here guarantees 5-star and tranquil accommodation yet within easy reach of the best restaurants and night life that Ko Samui has to offer. With it's spacious indoor and outdoor spaces the villa is the perfect choice for larger groups of families and friends. 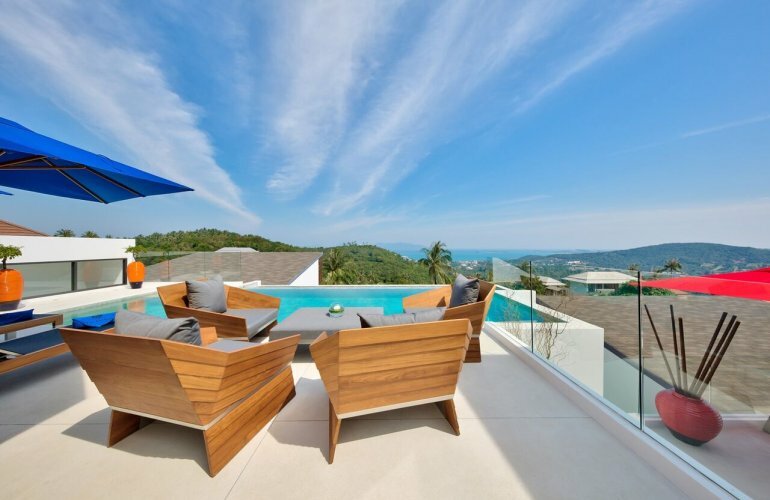 The villa has seating areas on the patio and comfortable sunbeds next to the large infinity pool where Samui's natural landscapes can be admired, providing guests with the perfect area to mingle with each other while enjoying a great view without the feeling of it being crowded. For those looking to entertain, this villa has a large, contemporary kitchen equipped with all necessary appliances and amenities you would expect to find in a villa of this standard. The open plan dining area provides guests with incredible views while dining and the living area is equipped with comfortable seating, a state of the art entertainment system and pool table. The villa has a well equipped private gym. Each of the villas 6 air-conditioned double bedrooms is equipped with a full size beds and furnished to the highest standard, each bedroom has an en-suite bathroom with a walk-in free flowing rain showers and stainless steel fixtures.